Chocolate-whisperer Hayden Mundy Moore has just arrived in Portland, Oregon, where she’s about to scarf soufflés and sip cacao-based cocktails at her friend’s engagement party. Fresh from nabbing her first candy-covered killer, the last thing Hayden wants to do is mix her love of chocolate with criminal mischief again. But then the groom-to-be turns up dead before beginning his renowned Chocolate-After-Dark tour. . .
Hayden’s friends insist that Declan’s death was a freak accident, but she knows there’s no mistaking the bitter aftertaste of homicide. In the midst of habañero hot chocolate and mocha-chunk gelato, a choco-crazed killer waits to strike again. Hayden will need to use more than her extraordinarily gifted taste buds to bring this murderer to justice, but she just might have bitten off more than she can chew in the process. 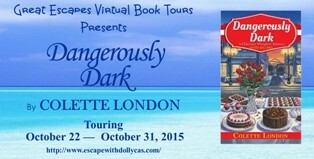 . .
Colette London is the pseudonym of a best-selling novelist who’s published more than three dozen books worldwide. new author for me looks like a great read. 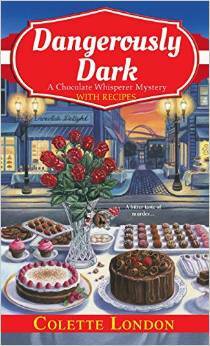 A cozy mystery & chocolate - what's not to love! Every stop on the book tour makes me want to read this more. Chocolate and a mystery, yum.